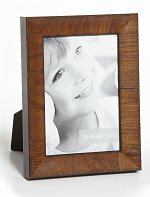 in its foray into producing photo frames of distinction. with the same attention to detail and quality craftsmanship. eclectic to traditional styles appealing to all consumer taste preferences. 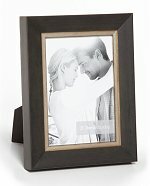 Palio Collection - This Roma photo frame collection captures a time-endured beauty with it's hand distressed characteristics and slightly rustic flair on a contemporary profile. Made in Canada with Italian moulding by Roma Moulding Inc. Frame width: 1-1/8 inches 5x5 inch Roma photo frame illustrated Available Sizes: 4x6, 5x5 & 5x7 For Thirty six years Roma's innovative designs, superior craftsmanship and exquisite style have made Roma an industry leader - fine custom frame moulding and premium photo frames. Metro Collection - An elegantly beaded edge creates the perfect crevices to capture the hand applied gold and silver leafing and creates the perfect balance between tradition and innovation. 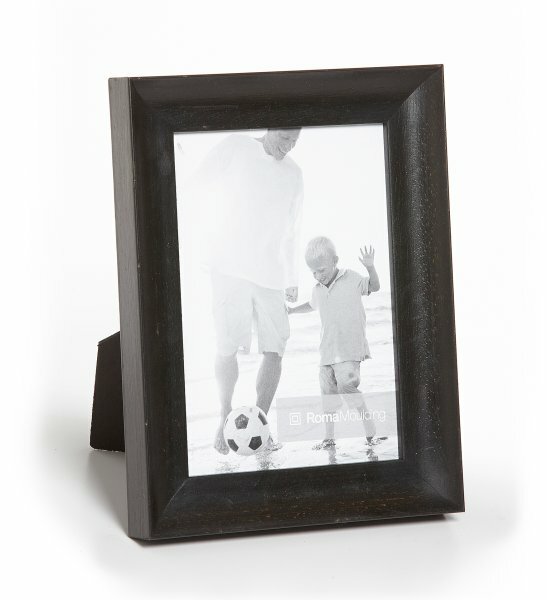 Made in Canada with Italian moulding by Roma Moulding, Inc. Frame width: 3/4 inches 3-1/2x5 inch Roma photo frame illustrated Available sizes: 4x6, 5x5, 5x7 & 8x10 For thirty-six years Roma's innovative designs, superior craftsmanship and exquisite style have made Roma an industry leader - fine custom frame moulding and premium photo frames. Metro Collection - This Roma photo frame has an elegantly beaded edge that creates the perfect crevices to capture the hand applied gold and silver leafing and creates the perfect balance between tradition and innovation. Made in Canada with Italian moulding by Roma Moulding Inc. Frame width: 3/4 inches 5x7 inch Roma Photo Frame Illustrated Available sizes: 4x6, 5x5, 5x7 & 8x10 For thirty six years Roma's innovative designs, superior craftsmanship and exquisite style have made Roma an industry leader - fine custom frame moulding and premium photo frames. 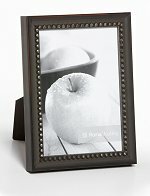 Metro Collection - This Roma photo frame has sleek, architectural lines that give this collection it's contemporary characteristics while the smooth hand leaf patina finish with a charcoal wash creates a subtle aged appearance. 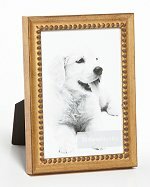 Made in Canada with Italian moulding by Roma Moulding Inc. Frame width: 1-3/8 inches 5x7 inch Roma photo frame illustrated Available sizes: 4x6, 5x5 & 5x7 For thirty six years Roma's innovative designs, superior craftsmanship and exquisite style have made Roma an industry leader - fine custom frame moulding and premium photo frames. Tabacchino Collection - The genuine olive veneer finish is perfectly aged by nature's elements that roll across the hills of the Tuscan countryside and is expertly applied by master artisans onto the elegant profile used in this photo frame. 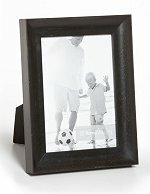 Made in Canada with Italian moulding by Roma Moulding Inc. Frame width: 1-1/8 inches 5x7 inch Roma photo frame illustrated Availabe sizes: 4x6, 5x5, 5x7 & 8x10 For thirty six years Roma's innovative designs, superior craftsmanship and exquisite style have made Roma an industry leader - fine custom frame moulding and premium photo frames.